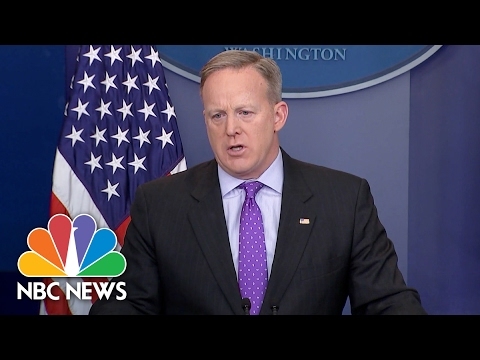 One-man fake news channel Sean Spicer, Trump’s spokesman, said Wednesday that anyone who criticized the botched raid on Yakla in Yemen that killed innocent children and other noncombatants and left a Navy Seal dead “owes an apology” to the deceased sailor. This assertion is perhaps the most disgusting thing Spicer or Trump have said, and boy is that saying something. It is also the height of hypocrisy. Doesn’t Trump therefore owe an apology to the 4,486 US military personnel killed in Iraq? Governments are very good at the political shell game of getting up a war and then demanding support from the public in the name of the grunts they just sent into some godforsaken desert or jungle. I remember how angry I used to get when W. would come on t.v. and say he was a “war president” and hadn’t sought that position. He literally went to war against Iraq for no good reason and turned himself into a war president! In using this term he was asking the US public to defer to him. It still makes me throw up a little in my mouth. Spicer did the same thing Wednesday. There is a difference between supporting our troops and supporting the government that often unwisely or unnecessarily puts them in harm’s way. The analogy I make is between active duty personnel and defense attorneys. They often do not get to decide which cases they pursue, and sometimes they are ordered to defend a client who is actually guilty. But you don’t vilify the defense attorneys. They are just doing the job the US public asked them to do. Likewise you don’t vilify the troops. The don’t make policy. (Of course if a military person commits a war crime in the field, that is condemnable). At the same time, using troop deaths to shield a president from criticism is disgusting. The Bureau of Investigative Journalism did follow-up interviews in Yakla in Yemen and discovered the raid ordered by Trump killed 9 young children, one a US citizen, and all together it killed 25 civilians. Republican critics like Sen. John McCain saw the death of a Navy Seal and the crash of an Osprey aircraft worth $70 million as indictments of the raid. “It is already known that 8-year-old Nawar al Awlaki, the daughter of al Qaeda propagandist Anwar al Awlaki was among those who died in the attack. But following a field investigation, the Bureau can today reveal that nine children under the age of 13 were killed and five were wounded in the raid in al Bayda province on January 29. Details emerged piecemeal last week regarding civilian and military deaths, the disputed value of the targets and deficiencies in planning – some of the information coming from military sources in unprecedented briefings against its own administration. Insiders told CNN and NBC that the ultimate target was AQAP leader Qasim al Raymi. If the soldiers didn’t find him in the village they hoped they would find clues as to his location. AQAP says 14 “of its men” were killed in the clash, including six villagers. The youngest was 17, the oldest 80.